Thanks to Oriental Trading for providing some products in this post. All opinions expressed here are my own. It’s the holiday season and Christmas parties are happening left and right. School age kids have classroom parties, adults have work parties, then there are family and friend get togethers. I have small children and often times they tag along but rarely do they get a party of their own. 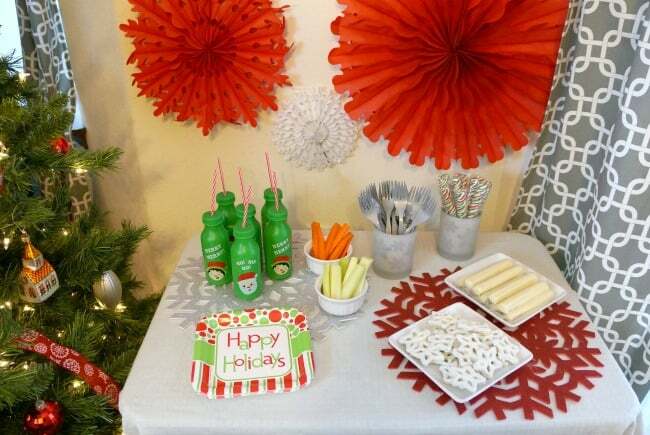 I thought it would be fun to throw a toddler Christmas party for my 2-year-old and her friends with food, crafts and decorations tailored just for them. 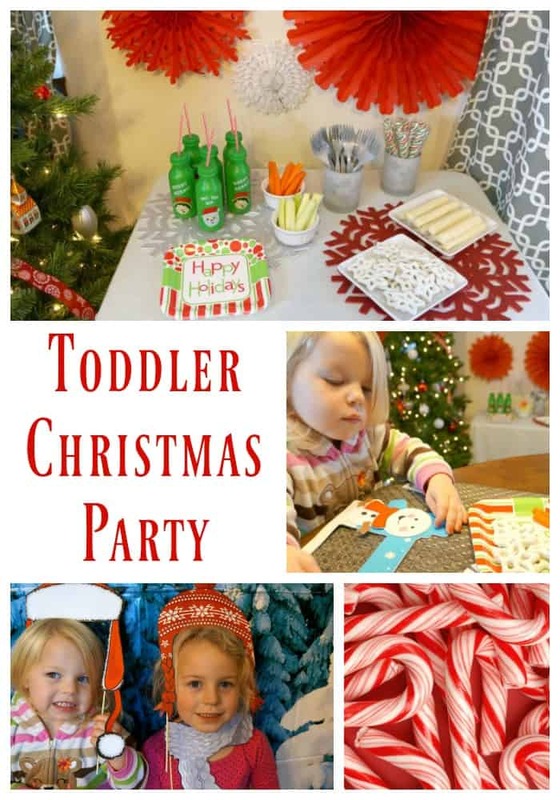 Here’s how you can throw a Toddler Christmas Party. I wanted to have a party with a few snacks, one craft and one activity that 2-3-year-olds would enjoy. Kids this age really just want to play and explore, so too much structure would be a bit much. I opted instead for a simple set up that they could partake in at their leisure. Start at Oriental Trading and pick a theme. I chose red and white winter items that I know I can reuse for other events. These decorations hold up really well and I’m looking forward to using them for my family Christmas party too. 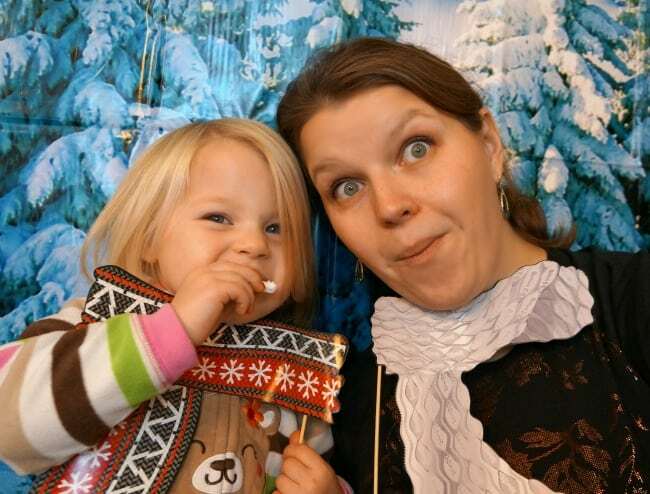 Create a photo booth. I chose a winter back drop and hung it up in my kitchen, a big statement with very little effort. I paired that with a set of winter hats, scarves and other fun photo props that the kids and adults can use to take silly pictures. Chose a craft. 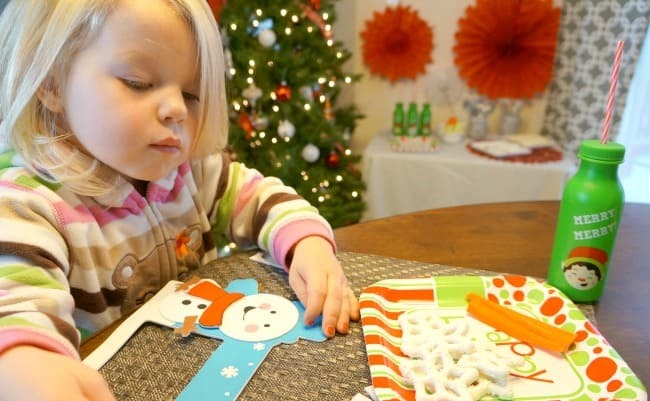 I chose an easy craft, a snowman picture frame, that kids can work on with an adult. They just peel and stick the pieces together. Very little mess! 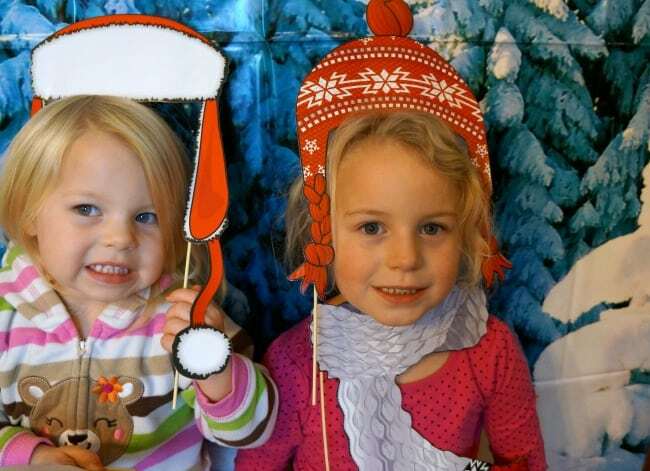 This craft works really well with the winter-themed photo booth. It makes for a cute memory after the party. Set a Kids Sized Buffet. For food I went simple, really simple. Kids can be picky so a fancy spread is really not necessary. I chose carrot and celery sticks, yogurt pretzels, and string cheese. I served water and juice in cute straw bottles that kids can take home after the party. I set all the food out on a kid-sized table so little hands can reach. These few activities, simple food and pretty decorations make for an easy and festive Toddler Christmas party. To top it all off I sent each friend home with a festive gift box that included a fancy lollipop, their craft with a photo, and a bottle. A few mementos from a fun party. Get everything you need at Oriental Trading and throw a memorable party for your little ones this year.